By following these 8 easy steps you can drastically improve the quality of your webinars. Bandwidth is something that most people take for granted when hosting a webinar. The fact of the matter is without sufficient bandwidth your video stream isn’t going anywhere. Jan suggests that you test your bandwidth connection prior to your event by going to www.speedtest.net. This site will allow you to check your ping, as well as upload and download speeds for free. Always make sure you have high upload speed to ensure a smooth video stream. Think contrast first, a black shirt against a black background lacks aesthetic appeal. You do not want to get lost in your background but also keep in mind that you do not want to pop out either. Try to find a natural balance between you and your background. Also, if possible try not to wear glasses - Glasses tend to create glare and can be a distraction to your audience. 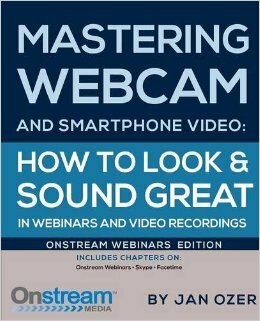 Presenting a professional video stream is an important part of your overall webinar. Always remember to shoot from eye level. Shooting video too low or high could create some unfavorable angles. Be sure to remember the rule of thirds; draw a tic-tac-toe board on your screen and try to position your eyes to be in the top row center of the board. Lighting can make a big difference in your video, so try not to settle for only overhead lights! Purchasing an inexpensive clamp light in which you can adjust in front of you will make a significant difference in the amount of exposure you receive. Fine-tuning your webcam goes hand-in-hand with your lighting setup. If you are able to get sufficient exposure through your lighting, your webcam will usually automatically get the best picture. However, if your lighting is lack luster you may need to go into your webcam preferences to manually adjust brightness, gain, and contrast. Although it can be a simple solution, using the microphone that is embedded in your computer can have some big drawbacks. Embedded microphones are omni-directional; meaning they can pick up ambient sound and other noise from your computer. The better solution is to use an external microphone which uses a cardioid pickup pattern that minimizes ambient sound and echoes. If you were to look at a waveform of the sound from your microphone, the ideal picture would consist of very large waves while you speak and very flat lines when you are silent. The better quality of microphone you use will dictate how much background noise gets picked up. Referencing back to audio volume targeting, adjusting the volume on your computer is an important step. In order to produce the best audio quality you may need to make some adjustments to your computers volume. Onstream Media is a leading online service provider of corporate audio and web communications, including webcasting, webinar, webconferencing and video publishing technology. Our innovative webcasting platform is ranked #1 by TopTenREVIEWS, and Infinite Conferencing, a division of Onstream Media has been recognized by the International Business Times as the #1 conference provider. 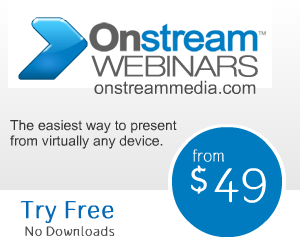 To learn more about Onstream Media please log onto www.onstreammedia.com.